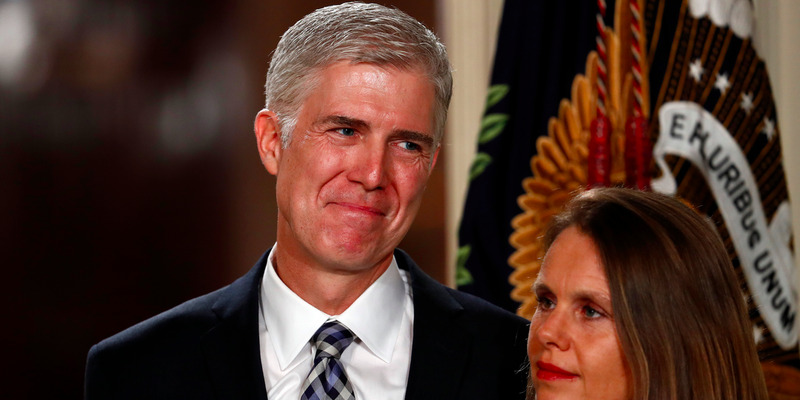 President Donald Trump on Tuesday nominated Judge Neil Gorsuch, who serves on the 10th US Circuit Court of Appeals in Denver, to serve on the US Supreme Court. "Judge Gorsuch has a superb intellect, an unparalleled legal education, and a commitment to interpreting the Constitution according to its text. He will make an incredible Justice as soon as the Senate confirms him," Trump said in a statement. Trump said during his campaign that he would seek to "appoint judges very much in the mold of Justice [Antonin] Scalia" — a characteristic that Gorsuch embodies in particular. In a speech to Case Western Reserve University's law school shortly after Scalia's death in February 2016, Gorsuch praised Scalia for his unyielding textualism — interpreting a law according to its plain text, rather than considering the intent of the lawmakers or the consequences of its implementation. Similarly, Gorsuch also supports originalism, meaning he seeks to interpret the law according to the meaning of the Constitution as it was written.